Crafted from a luxurious white two-fold royal twill, The Tuxedo Shirt includes a removable button band that enables the shirt to be worn with studs or buttons. 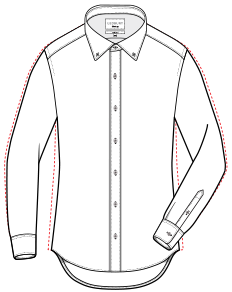 Additionally, a placket covered waist button allows the shirt to be worn without a cummerbund. Finished with the Ledbury Spread Collar and rounded French cuffs. Fit: Tailored fit features a darted back for a tailored fit throughout the torso.